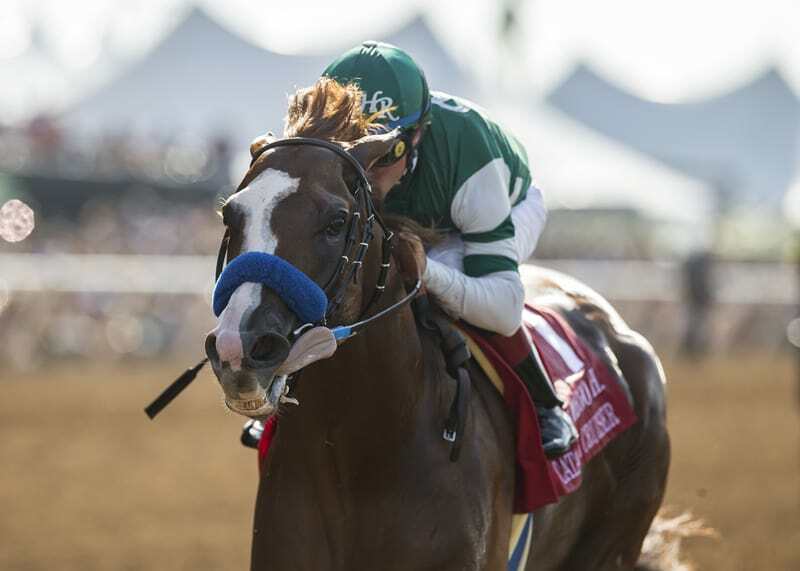 DEL MAR, CA – Hronis Racing’s 6-5 favorite Catalina Cruiser broke sharply from the gate and never looked back, cruising home to a commanding win in Saturday’s Grade 2, $200,000 San Diego Handicap at Del Mar. Shooting out from the rail under Drayden Van Dyke, Catalina Cruiser had Dr. Dorr along his outside hip early while setting splits of :23.07, :47.70, and 1:11.64. Down the backside, Van Dyke angled Catalina Cruiser out ever so slightly, riding in the 2- and 3-path while forcing Dr. Dorr to ride even wider. Heading into the far turn, Van Dyke let out a notch in the reins, and it was game over from there. The John Sadler trainee began steadily increasing his lead as he straightened for home and was set down for the drive with nothing but clean dirt in front of him. Wrapped up late, the John Sadler trainee hit the wire with a 6 3/4-length advantage in a final time of 1:42.95 for the 1 1/16-mile main track event. Dr. Dorr held off the rest of the field for second, while fellow Bob Baffert trainee Dabster was able to get up in the final steps to steal third from Two Thirty Five. The longshot Harlan Punch completed the order of finish in a field that saw as many scratches as entries, with Sharp Samurai, El Huerfano, Prince of Arabia, and fellow Hronis Racing-owned/Sadler trained Accelerate and Curlin Rules all failing to make the gate. Catalina Cruiser’s win was his third in as many starts, including a debut victory last October and a dominating return in May. The late-blooming 4-year-old son of Union Rags has now earned $183,600 and is likely to return here in the Grade 1 Pacific Classic next month. Regarding the Pacific Classic, Sadler did not commit which of his two older male stars would make the gate, but he did not seem keen on the idea of running them against each other. Catalina Cruiser returned $4.60 to win, $2.80 to place, and $2.40 to show. Dr. Dorr brought back $3.40 to place and $2.60 to show, while Dabster paid $2.80 to show.